Kate Pearson from Leeds is the first to use a new technology in LED luminescent materials to replace the traditional lining of bags, solving the struggle and frustration of rummaging around trying to find things in the dark. Kate has designed bags that automatically switches on when opened, providing an attractive subtle glow – which illuminates the entire inside of the bag with a discreet personal light. Kate’s brand, Fabrikk, focuses on innovative new materials and technology, ethical sourcing and quality local manufacturing to bring a unique and niche concept to the market place. 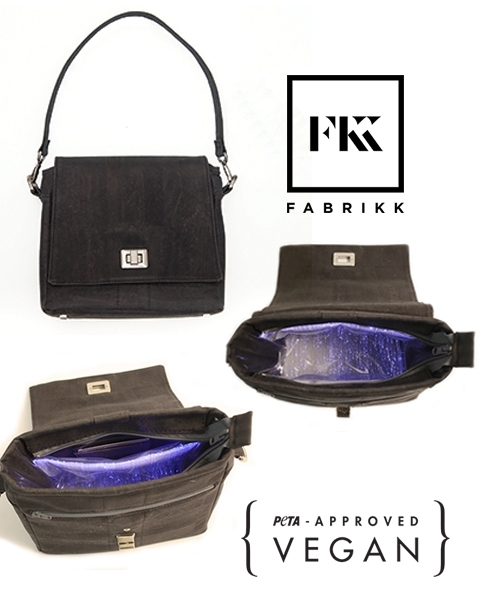 Their first product, the Fabrikk Vela, is a small, stylish ladies bag made from a variety of vegan-friendly cork leathers and of course the new LED material inside. Yorkshire-based business Fabrikk is committed to using new and innovative materials in their designs, and is the first brand in the world to integrate this type of LED technology into bag linings. Light emitting fibre optic threads are weaved into traditional material, creating an illuminated fabric that is easy on the eyes. The bags are powered by a small battery pack and a single LED source that can be changed to white, red, blue or green light, depending on your preference. The Vela also features exciting new material cork leather. Made from the bark of the cork tree, it’s been gaining popularity as an alternative to traditional animal skins, due to being soft, durable, vegan and environmentally friendly. The Vela is now in production in the UK, and is available to buy at www.fabrikk.co.uk, in black, natural and green snakeskin (no snakes were harmed in the making!) with more colours and styles coming soon. Fabrikk was founded in 2014 from Kate’s home studio in Leeds; after having the idea for LED powered bags, she worked closely with a local engineer and a family owned manufacturers in Wrexham to develop the initial prototypes and then the finished product. The Vela, Fabrikk’s first bag, is now in production here in the UK and is available to buy now at www.fabrikk.co.uk. In 2015 Kate was awarded a place on the new Entrepreneurial Spark business accelerator programme in Leeds and launched her online store in August 2016. Since the launch of site the Fabrikk brand has popped up in boutiques around London, been showcased on the Ethical Fashion Forum and Not Just A Label online and in the Spotted section at the Top Drawer trade show in London A/W 2016. The brand is now also producing a new range of unisex cork leather flat caps and baker boy hats to compliment the Vela handbag range. Most recently the brand has worked with Voir Fashion Studios on a new photo campaign, with music artist Tom Zanetti modelling their new hats. “I am extremely excited to launch the Fabrikk brand after years in development and set up; it’s amazing to see everything finally come together. Being passionate about new tech materials, ethical sourcing and manufacturing, we source the best quality materials from credible suppliers and have built strong relationships with all our suppliers and UK manufacturers to ensure full transparency and the highest quality. •	FABRIKK is a new, niche luxury accessories brand based in Leeds, West Yorkshire – it launched online at www.fabrikk.co.uk in August 2016. •	FABRIKK is a design-driven innovative brand, focusing on animal-friendly tech-led materials, and providing creative and original products to a positive, conscientious, curious, and on-the-move consumer. •	The brand focuses on new materials and technology to give their products unique levels of functionality and customization. •	All FABRIKK products are ethically sourced and handmade in Great Britain.